So many screens– so little to see. GODZILLA is godawful. And put a big X through X-MEN: DAYS OF FUTURE PAST. Coasting on the devotion of diehard fans who remember the back stories, this latest installment suffers from franchise burnout and never breaks a sweat. How about MALEFICENT? What could be better than Angelina Jolie in a black cape, a pair of horns, and matching razor sharp cheek bones? Jolie’s a blast, but the script goes flat and there’s no way in hell that lump of a boy-turned-king should have caused her all that trouble. So I went “artsy” and tried THE IMMIGRANT starring gorgeous French Oscar winner Marion Cotillard. I thought I’d kill myself as the credits came up. This morose tale of a beautiful Polish immigrant caught in a sick love triangle with her pimp (Joaquin Phoenix) and his wacko magician brother (Jeremy Renner) is unrelentingly bleak, pretentious, and looked like it was shot through a glass full of piss. FINALLY I sat through a double feature– a tragic teen romance, and Tom Cruise’s latest action adventure– and VOILA! Two really good films which did what a revered critic once told me every good film must do: it should accomplish what it sets out to do. THE FAULT IN OUR STARS wants us to cry, and OH, did I! It was fantastic. 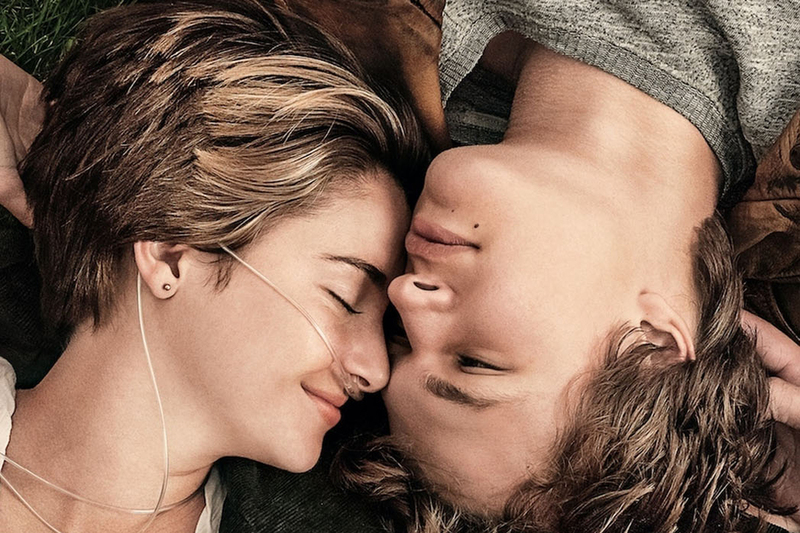 The movie, based on John Green’s best-seller, features the lovely Shailene Woodley as Hazel Grace Lancaster a teenager with cancer who plays every scene with an oxygen tank and a nose apparatus. She meets Augustus Waters “Gus,” played by the pillow-lipped Ansel Elgort. This kid is the perfect boyfriend–he too has cancer and is missing a leg. He pursues her like mad at a cancer support group where she does her best to put him off with her hard-won cynicism, but he’s charmed by her equally apparent honesty and goodness. Together, they really are a dream. Remember LOVE STORY? Well I’m sorry. This is a much better film. It has a lot to say about the fragility of life and what it all means– or doesn’t. Despite the gooey premise–dying young teenagers in love– the film avoids sappiness. The two romp all over colorful Amsterdam on a fairy tale trip and a disastrous meeting with a hardbitten novelist (Willem Dafoe in a weird performance — is that redundant?) But they return to reality, confront the hard questions, and come up with no easy answers packed with wisdom and heart. Great cast including Laura Dern as a wonderful mom. Prepare to be moved. THEN see EDGE OF TOMORROW–it wants to nail you to the edge of your seat, and does. An action-adventure, sci-fi thriller that will also keep you thinking, it’s “Groundhog Day” meets “War of the Worlds.” Tom Cruise plays, initially, against type as a military man– in charge of media relations(!) His biggest fear is getting a paper cut. Suddenly, he’s bamboozled onto the battlefield and finds himself in an endless loop, forced to repeat the same battle against killer aliens over and over again, if and until he gets it right–and maybe saves the world. Emily Blunt is at his side as a latter day Joan of Arc–a fighting machine known as The Angel of Verdun. She’s never looked better, and Tom? He still looks great. Makes you wonder–who’s the alien here..?! Smart, fun summer entertainment until the big guns roll in in the fall just before OSCAR season. Stay tuned! Thanks for the recommendations and I will get to see them.